Huge thanks to Spahten and Team Mike McNeil member Mike Hastie for his efforts in co-ordinating the biggest team at Blizzard Blast, and for writing this review! When most “normal” people think of exercising/running/racing, they usually count the time from October to March as “off-season”…a time to hit the treadmill and keep their training to the warm & cozy confines of their home or a gym. 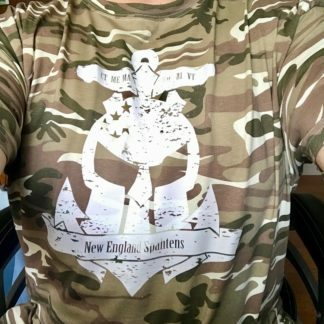 I know I’m stating the obvious, but the New England Spahtens have never been accused of being “normal”. 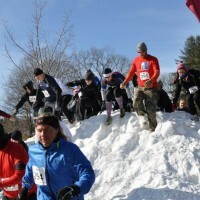 While a group of us spent the weekend in Vermont for the Polar Bear Challenge in Shale Hill, the bulk of us stayed local for the Blizzard Blast 5K Obstacle Run in Lowell, MA. When I created the team and became the unofficial “Captain” for this event, I certainly did not think it was going to catch on like the plague, especially since there was already the Polar Bear Challenge on the same day. But as fate would have it, the OCR-hungry Spahtens began registering for this event in droves. A huge THANK YOU goes out to Fred Smith, the event director for the Blizzard Blast. He worked and re-worked (and re-worked a few more times) the heats so that all of us (39 when all was said and done) could toe the line in the 12:20 heat. Race day arrived and I made my way over to Holy Ghost Village, the site of both pre-race registration and the post-race Blizzard Bash. The venue was very easy to find, and had ample free parking. Inside, the function hall was huge, and very well marked for waivers, registration, free bag check, and race packet pickup. The bar was open (a key observation for later), and they were serving hot bowls of chili, clam chowder, and chicken soup. Outside the rear entrance of Holy Ghost, some vendors had set up small tents and gave out free water, bananas, granola bars, and other assorted goodies. There was also a free Agility Course set up, in which participants had to make their way up/over/around/through various obstacles while holding a weighted bag. The man & woman with the quickest time through the course received a prize. After picking up my race packet and free long-sleeved tee, I met up with the growing group of Spahtens at one of the rear tables. Spirits were high and excitement was in the air as more (and more…and more) Spahtens joined the group. Soon it seemed that just about all of us were there, so we made our way over to an open space for our group photo. The Team readied ourselves, pinning on our bibs and getting our cold gear ready. Our heat time was announced and we made our way to the school bus that was to transport us to Shedd Park, a quick 1-minute bus ride away. On the ride over, a Blizzard Blast volunteer gave us the rundown of the event; the do’s and don’ts so to speak. We arrived at Shedd Park in the blink of an eye and ambled on over to the start line. On the balcony above the start line, a DJ was spinning tunes and getting the racers amped for the course. 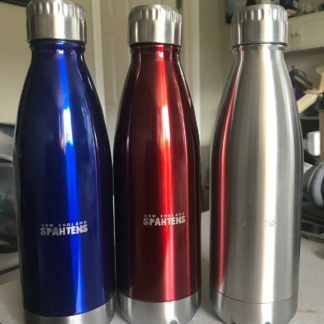 Upon seeing us, he said “So I hear we have some Spahtens in the house” which was followed by loud hoots and hollers from the Spahten Ahmy. He also passed on a message from the race director, congratulating us on being the largest what? “TEAM!” yelled the Spahtens. He gave us the 1-minute warning, and we all toed the line and got ready to blast. We got the word to GO, and off we went, climbing over a small mountain of snow and across the start line. From there we ran roughly ½ mile on a mix of pavement and trails to the first “obstacle” – The brick sprints. Simple enough – grab a brick, sprint about 10 yards, drop it, pick up another brick, sprint back, repeat. After another bout of running came the 3 spider webs, which were easily navigated provided the person in front of you didn’t get stuck. 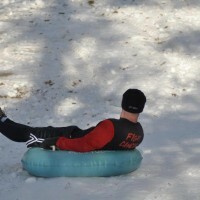 A bit more trail running led you to the pool noodle and saucer sleds that were hanging overhead. Next came the Christmas tree drag & throw, one of the more unique “obstacles” this racer has come across. You were to pick up and/or drag a Christmas tree and make your way up a small hill and around a path to a wall, where you would throw the tree over the wall and run around to the other side and retrieve it. Drag/carry it back to where you got it and off you went. The next few obstacles were what seem to be standard OCR protocol – 8ft cargo net, solid wall climb, and vertical ladder wall climb, all with snippets of trail running between them. Upon dismounting from the ladder wall, the volunteer instructed us to follow the marked path and “go through the bus”. Ummm…ok. Sure enough, around the next bend was an old broken down school bus! Run in through the front door, make your way down the aisle while avoiding the saucer sleds hanging from the ceiling, and out the back door! Again, very unique! Some more hilly trails led you to another first for this OCR’er – The dumpster dive! Scale the outer wall of the industrial sized dumpster, and in you go, greeted by a very giving pile of Styrofoam peanuts! Climb out, shake yourself off, and off you go into a good distance of running. This is where the Blizzard Blast really took advantage of the elevation gains of the Fort Hill section of Shedd Park. A steady incline of icy zig-zagged pavement led you to the top of Fort Hill, where you were greeted by a log balance obstacle. Jaunt along a series of 2 elevated logs. Easy peasy. A short but very welcomed downhill run brought you to a well-type structure, where you simply climbed in and climbed out. Easy, right? WRONG. This is where a good deal of casualties took place due to the icy step on the way out of the well! 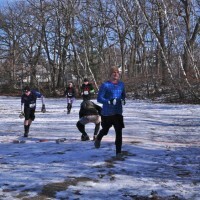 If you made it out of the well unscathed, you proceeded up another very icy hill and over to the Spartan-esque “through, under, and over” walls. Conquer those and you were out of the woods (literally, but not figuratively). Run your way back over to Shedd Park and over a double series of tires, down an icy path along the outskirts of the park, and over to the bottom of the hill where you grabbed an inflated donut. Run up the hill and let the fun begin! A quick plop down, a few shuffle steps forward and down the hill you went! Toss the inner tube and off you go. The final obstacle on the course was what is becoming another OCR staple – the tunnel crawl. Wiggle your way through the tunnel, weave around a few upright foam posts, and it’s a mad dash to the finish line. Upon crossing the finish line, you were awarded your handsome medal (actual bling, a nice step up from the paper medals awarded at Panic in the Park) and a complimentary bottle of water. 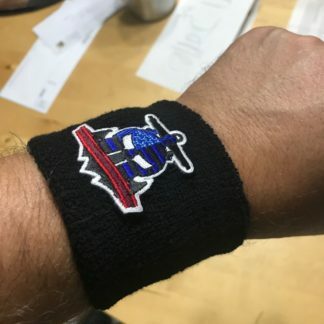 From there you could hang around for your friends and/or teammates, or you could hop on the nice warm bus and head back to Holy Ghost Village for the Blizzard Bash. The post-race bash was great, with live music and general merriment. The team got together and shared race stories over a few beers (first one was on the house) and a free bowl of hot chili, clam chowder, or chicken soup. Some of us opted for the “Caveman’s Delight”, a 4-foot skewer with about 6 slabs on raw meat on it. You could cook it yourself over the open fire pit out back, or just eat it raw, a la Scott Houghtaling. When the final results came in, the Spahten team was ecstatic to learn that 2 of our own secured themselves a spot on the podium! Ned Dalzell took home 2nd place overall, and Mario Da Silva nabbed 3rd place overall. Other notable Spahten finishers were Casey O’Connor (5th overall) and Robert Bonazoli (12th overall). And, you guessed it; the New England Spahtens easily took home the honors for Largest Team, with 39 of us braving the elements for this event! The Race Director presented me with this flag; a very nice token of appreciation and a great addition to the Spahten collection! Overall, I was very impressed with the entire event. The folks at SmithFest seemed to have learned a lot after their first event last October, Panic in the Park. They really stepped up their game in terms of obstacles, which was nice to see. They used every path, hill, nook and cranny of Shedd Park/Fort Hill to their full potential. Event organization was stellar from pre- to post-race. The volunteers were plentiful and very helpful. The course was set up very nicely, well-marked, with plenty of running room between the obstacles. They obstacles weren’t very hard for the average racer, but they were very well constructed. The organizers seemed to be taking a few obstacle cues from the likes of Spartan Race, and adding their own little twist to them. I’m sure I speak for the Spahten Ahmy when I say that we can’t wait to see what’s in store for Panic in the Park II, taking place on November 2, 2013. 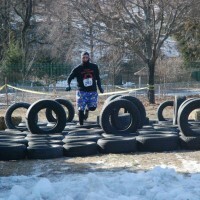 Next post: 2% of Ruckus racers have done a Spartan? Huh?